Meatballs and Spaghetti Sauce | Let's Eat! I can’t have a website called Sundaywithachanceofmeatballs.com without adding a recipe for Meatballs!! When I was growing up it seemed that my Grandmother, my Mother, my Aunt Jean and my Uncle Joe each had their own unique way of making meatballs. All of them were good, but none of them were exactly the same. My Mother’s are less spicy with minimal herbs and spices added, while my Aunt Jean’s were high in garlic, herbs and seasoning. I love my mothers meatballs, but I admit that I prefer my Aunt Jeans!! I like them spicy and well seasoned!! You can adapt this recipe to your own tastes and experiment with the seasonings and ingredients to make them your own!! 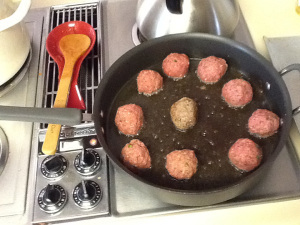 I use all beef for my meatballs, but you can vary this by using beef, pork and veal or any combo of each.